SOUTH BEND – For the second year in a row, Beacon Health System was named as a Healthiest 100 Workplace in America, an awards program presented by Springbuk®. Beacon was named No. 20 in this year’s ranking; last year, Beacon debuted at No. 34. Over 6,000 employers nationally applied for the award, which recognizes employers across six areas: vision, culture/engagement, learning, expertise, metrics and technology. Medical claims cost (per employee per year) 20 percent less than the National Healthcare Market Benchmark measure. 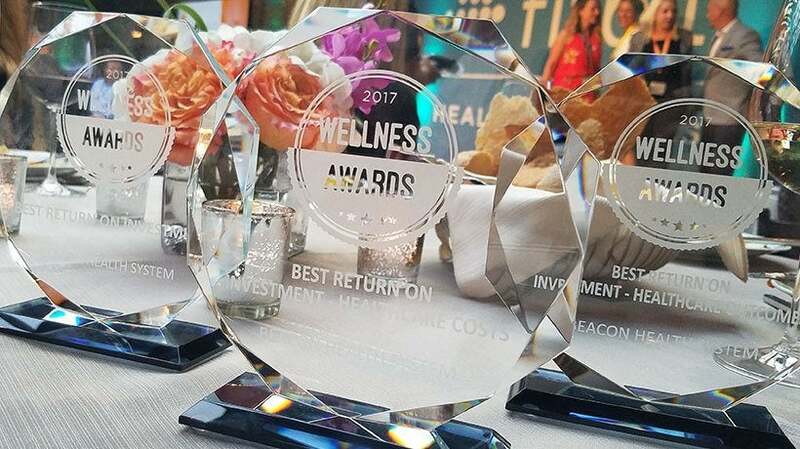 An overall ROI of 5.5:1 for the employee wellness program. A net ROI of 18:1 for associates and spouses participating in Beacon’s disease management program. A unique feature of LiGHT (Living in Good Health Together), Beacon’s holistic wellness program, is that associates and their spouses may earn points by performing activities to benefit their overall well-being, including exercising, volunteering, managing stress and establishing a budget. As participants earn points, they become eligible for prize drawings throughout the year. Points earned annually can also help associates earn a discount of up to 10 percent on their medical insurance premium for the following year. Beacon Health System is the nonprofit parent organization of Elkhart General Hospital, Memorial Hospital of South Bend, and the 350-provider Beacon Medical Group and is the largest, locally owned health system in the region. Together, Elkhart General Hospital and Memorial Hospital of South Bend employ more than 7,000 team members and volunteers and are staffed by nearly 1,000 physicians. For more information, visit www.beaconhealthsystem.org.